"Cruis'n USA is an arcade racing game released in 1994. It was developed by Midway Games and published and distributed by Nintendo. 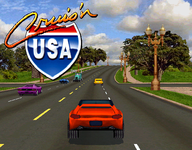 It's the first game in the Cruis'n series and it features locations around the United States. Although Cruis'n USA was advertised as running on Ultra 64 hardware (based on the Nintendo 64's hardware), it was actually implemented on the Midway V-unit hardware. The hardware consisted of a TMS32031 CPU clocked at 50 MHz, an ADSP-2115 DSP clocked at 10 MHz for sound and a custom 3D chip that could render perspective-correct but unfiltered quads at a high resolution (512 x 400 pixels). Along with Killer Instinct Gold, it was planned as a launch title for the Nintendo 64. Neither game made it out for Nintendo 64's launch, however, primarily because the arcade versions of both games were done on hardware that was very different and somewhat more powerful than the console. Cruis'n USA, although impressive in arcades in 1994, got panned in 1996 when it was finally released on the Nintendo 64 because the port was less polished than the arcade version and its technology had already been surpassed by other games. It was released on Wii's Virtual Console in Europe on March 28, 2008, making it the first third party developed Nintendo 64 game to be released on the service." Source: Wikipedia, "Cruis'n_USA," available under the CC-BY-SA License.